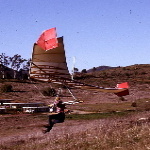 I would like to mark today - July 26th, 2017 - as an important day in the history of hang gliding. Thanks to those who've helped ... you know who you are. You will all know what this news is after Monday. ALERT: It will not be "fake news". OL and JH are watching this matter from afar. Initials will be defined later. "Oops there goes a billion kilowatt dam." 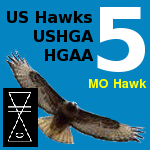 Thanks to all members of the U.S. Hawks who've maintained their high hopes. Frank Colver wrote: You will all know what this news is after Monday. I can hardly wait for the breaking news. Just to be sure I'm going to start surfing the Hawks late Monday in case the news breaks just after the closing of the business day. Or maybe just after midnight on Monday. I'LL JUST PARK HERE AND KEEP CLICKING ON, "REFRESH," EVERY THREE SECONDS STARTING NOW! Bill Cummings wrote: I GOT IT! ... just picture Bill clicking "REFRESH" every three seconds. I caught that post!!! Thought I was kidding HUH? I had to switch fingers already. My plan might not work. I had no idea how fatiguing a poised finger could be.